Provides the most comprehensive, up-to-date set of forms available on the market, complying with all recent amendments to controlling procedural rules. Bender's Federal Practice Forms provides the most comprehensive set of forms available on the market. All of the criminal forms are up-to-date, including compliance with all recent amendments to controlling procedural rules, and comply with the standards of practice in federal courts generally. All of the forms are located in chapters based on the controlling procedural rules. Volumes 16 and 17 deal with criminal prosecutions in the United States District Court. 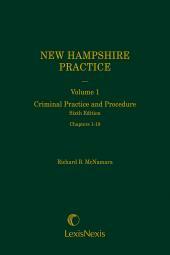 The forms are organized into chapters based on the relevant Federal Rules of Criminal Procedure. Volume 17 also deals with collateral attacks (i.e., post-appeal attacks) on criminal convictions that may be brought in United States District courts, including the rules and official forms for Section 2255 motions for relief from federal court convictions and habeas corpus review of state court convictions.